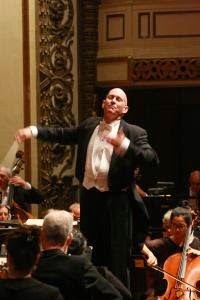 To open the SSO’s 71st season and his own 14th season as music director, Kevin Rhodes presented what he calls in his “Rhodes’ Reflections” column in the program book “three incredible showpieces for orchestra” which feature all these musicians as soloists. In doing so, the clever maestro also upended some classical programming traditions. Ravel’s crowd-pleasing “Bolero” is usually a rousing closer, but Rhodes brilliantly engaged his audience by beginning the concert instead with this most familiar piece on the program. The opening notes of the snare drum’s steady ostinato rhythm established a slightly faster than normal tempo, and the excitement only grew as the sinuous melody first introduced by a solo flute gained instruments and volume with each repetition before reaching its “loud as possible” crescendo 14 minutes later. The SSO’s performance was exhilarating and carefully balanced. The concert closed after intermission with a dramatic rendition of Mussorgsky’s “Pictures at an Exhibition” in Ravel’s masterful 1922 orchestration. Among its many distinctive pleasures are the opening promenade for solo trumpet, the soulful saxophone (also notable in “Bolero”) in “The Old Castle,” and the chirping woodwinds in “The Ballet of the Chicks in Their Shells.” Rhodes and the SSO also captured the full majesty of the climactic “Great Gate at Kiev,” perhaps the grandest of all finales. After each piece Rhodes singled out many individual players and whole sections of the orchestra for “solo” bows. The percussion section was special fun to watch as they scrambled from one colorful instrument to another in meeting the many demands of this program on their formidable skills. The mutual respect clearly shared by all these musicians augurs a fulfilling season of great performances ahead. Although “Phantom of the Opera” and “Cats” have racked up considerably longer runs, “Evita,” which first arrived on stage in 1978, remains Andrew Lloyd Webber’s best work to date. Currently, the Bushnell is offering a production of “Evita” based on its most recent Broadway revival, and it is a triumph. A rags to riches story of a poor country girl with lofty ambitions, “Evita” transports its heroine, step by carefully calculated step, from “groupie,” to radio personality, to film actress, to mistress to the most powerful military man in Argentina, and finally to First Lady, with eyes focused on the country’s Vice Presidency. Without question, the centerpiece of this production is Caroline Bowman, who delivers a luminous portrayal of a woman determined to achieve her goals as she rises to an iconic pinnacle of adoration from her legion of followers. Bowman is superb as was recognized by Tuesday evening’s audience following her Act II performance of the “Don’t Cry for Me Argentina” anthem – a spectacular moment! Max Quinlan performs the role of Che impeccably as an observer and sometimes participant in the action, narrating and filling in gaps in the story of Evita’s rise from obscurity to stardom. Quinlan’s waltz with Evita is a gem. Sean MacLaughlin’s characterization of Peron diminishes the stiffness of earlier interpretations as it humanizes him and adds a layer of warmth. Christopher Johnstone, as the appropriately oily Magaldi, and Krystina Albado, as Peron’s pathetically rejected young mistress, each contribute excellent performances in secondary, but key roles. The large cast, meticulously directed by Michael Grandage, performs beautifully. What appears to be some judicious pruning of the book, allows for additional and welcome opportunities to feature the excellent choreography of Rob Ashford. Handsome and effective settings and costumes by Christopher Dram grant precisely the right touches, ranging from poverty to elegance. A somewhat reserved audience throughout Act I rose to the occasion with gusto following Act II with a well-deserved standing. 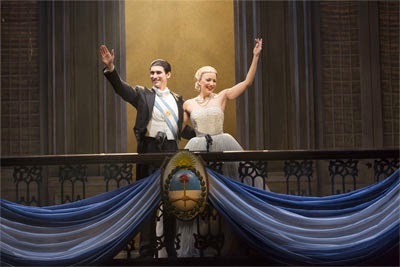 With this production of “Evita” the Bushnell has set a high mark for the remaining productions of their annual Broadway Musical series. 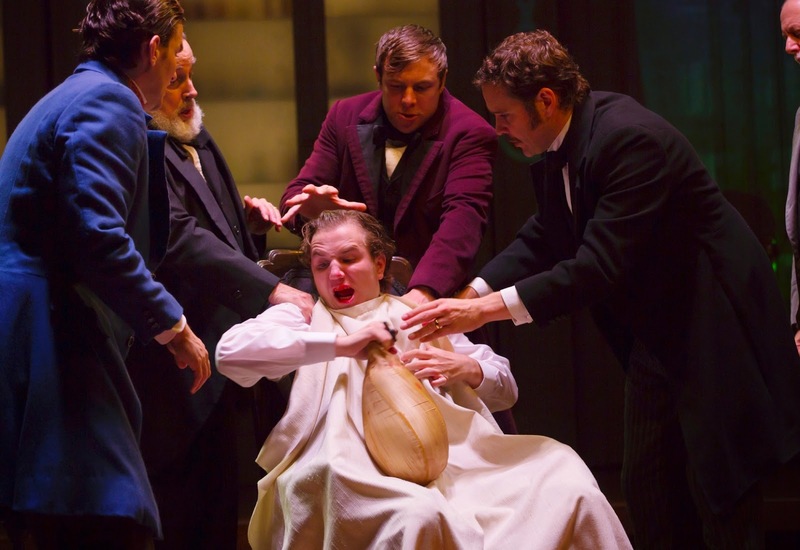 The publicity for HartfordStage’s production of Elizabeth Egloff’s new play, “Ether Dome”, uses the term “exhilarating,” leading the reader to suspect hyperbole. Instead, the word is an apt description for the energetic, engrossing story that unfolds. Egloff tells the story of four men whom were instrumental in the quest for relieving human suffering and what might be considered the “birth” of modern health care. In the process, humanity vs. opportunism, science vs. superstition, and change vs. the status quo become interwoven themes. Can the invention of anesthetic be attributed to only one man? Should Hartford dentist Dr. Horace Wells who used laughing gas to calm his patients get the credit? Should it be his apprentice, the ne’re do well William Morton, who attempted to patent the gas? Was it Dr. Charles Jackson, who favored science over superstition, or Dr. John Collins Warren, the founder of Mass General, who feared change? As the story unfolds, each of these men undergoes personal transformation as the medical world shifts. Egloff writes that Wells, for example, may have been the inspiration for Robert Louis Stevenson’s novel, Dr. Jekyll and Mr. Hyde. Does that pique your interest? The excellent ensemble cast is complimented by a brilliant scene and projection design by James Youmans who transforms the stage from the surgical space of the Ether Dome (which still exists at Mass General Hospital) to a variety of locations from Boston to Washington D.C., including a visually stunning representation of a New York subway platform. But the master of the show is director Michael Wilson who moves his cast through a fast-paced two hours and forty minutes of human drama and comedy as the personal stories unfold. Ether Dome is a gift to an audience who appreciate the occasional joke about Hartford and Boston, but who find the real story of a scientific breakthrough as mesmerizing as the drama and history that unfolds. HartfordStage has produced a winner with this very original, fascinating theatrical experience.